that is what the temp. was here yesterday. I am so lucky to live on a lake where we have been spending hours, (like all day) in the water. 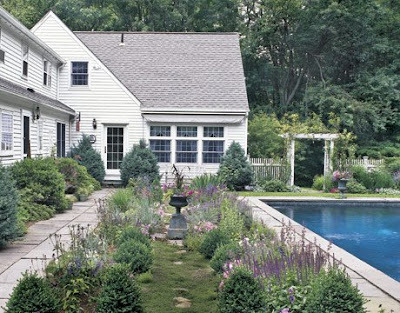 But, these pool images from Country living are pretty tempting! I just discovered your blog through Gracious Southern Living, and I must say...I LOVE IT! Your home is beautiful. Wow, 106??? I'm a southern gal used to high heat and humidity in the summer...but not 106! It's only been in the upper 80s here in Atlanta this week. Mostly due to overcast skies and rain that we desperately needed. Gee Melaine you beat us, we had about 103 here in Arlington. To hot!! I am ready to dig a hole in the yard and fill it with water, even muddy water is cooler. 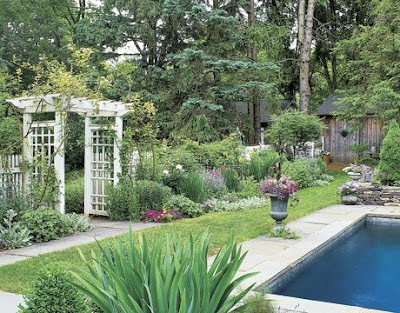 But hey those pool gardens sure are pretty! Go splash in the water again and drink lots of cold things! Oh, a Pool would be so nice today! I am in your neck of the woods, and the heat is killing me! Btw, I have enjoyed reading your blog. Love these pics. Thanks for sharing them with us. 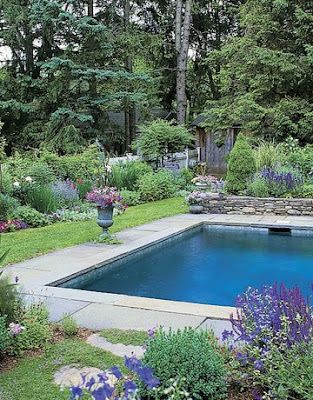 I want a pool just like that one. Spending time in the water at the lake sounds wonderful! Glad you have that because 106 is way too hot! Those are LOVELY images. 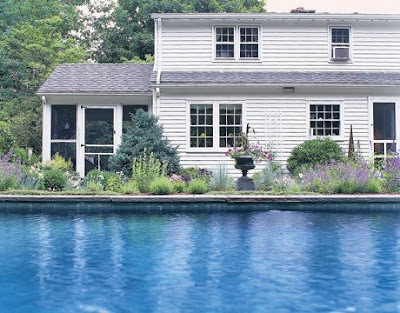 But having only a 15 foot kiddie pool in the backyard, I can only imagine the costs and work involved to take care of a real pool. Lucky you to have the lake!